I’ve previously blogged about the declining status of the United States, as measured by objective sources such as the Economic Freedom of the World Index and the World Economic Forum’s Global Competitiveness Report. But the real insult to injury is that America is dropping even according to indices created by left-wing groups. The Tax Justice Network is a bunch of crazy Euro-socialists (no snarky comments about redundancy, please), and they specialize in seeking to undermine tax competition in order to make it easier for government to impose class-warfare taxes and expand the burden of government. 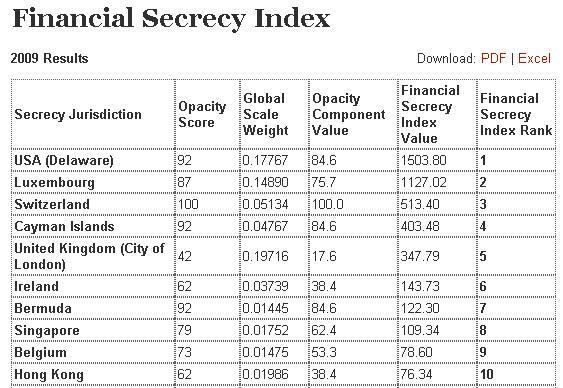 One of their projects in a “Financial Secrecy Index,” in which they identify the supposedly bad jurisdictions that have strong human rights policies on financial privacy. The TJN crowd hates privacy since it makes it difficult for greedy governments to track – and tax – flight capital. 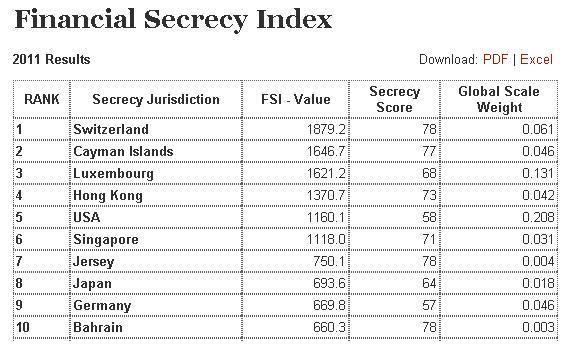 Anyhow, these statists issued their first Index in 2009 and I’m proud to say the United States came in first place, presumably because of our pro-growth policies to attract foreign investment and the business-friendly incorporation laws in states such as Delaware and Nevada. But now, as you can see, we’ve dropped to 5th place in the 2011 Index. I confess, though, that I didn’t bother to read the accompanying report, so perhaps changes in methodology account for America’s decline in the rankings. Regardless, it can’t be a positive sign that the United States is losing its status – particularly when we need more investment to counter the negative impact of the Bush-Obama policies. One can only hope that there will be changes that lead to America claiming the top spot when the next Index is released. By the way, for more information about the value of tax competition and financial privacy, click this link. And here’s a link to a British politician, Dan Hannan, who understands what is at stake.